The Arctic Archipelago, also known as the Canadian Arctic Archipelago, is a group of islands north of the Canadian mainland. Situated in the northern extremity of North America and covering about 1,424,500 km2 (550,000 sq mi), this group of 36,563 islands in the Arctic Sea comprises much of the territory of Northern Canada – most of Nunavut and part of the Northwest Territories. The Canadian Arctic Archipelago is showing some effects of global warming, with some computer estimates determining that melting there will contribute 3.5 cm (1.4 in) to the rise in sea levels by 2100. British claims on the islands were based on the explorations in the 1570s by Martin Frobisher. Canadian sovereignty was originally (1870–80) only over island portions that drained into Foxe Basin, Hudson Bay and Hudson Strait. Canadian sovereignty over all of the islands was not established until the 1880 transfer by Britain to Canada of the remaining islands. The District of Franklin – established in 1895 – comprised almost all of the archipelago; the district was dissolved upon the creation of Nunavut in 1999. Canada claims all the waterways of the Northwestern Passages as Canadian Internal Waters; however, the United States and most other maritime countries view these as international waters. Disagreement over the passages' status has raised Canadian concerns about environmental enforcement, national security, and general sovereignty. Hans Island, in the Nares Strait east of Ellesmere Island, is a territory currently contested between Canada and Denmark. Satellite image montage showing Ellesmere Island and its neighbours, including Axel Heiberg Island (left of Ellesmere). Greenland is to the right in this photo. 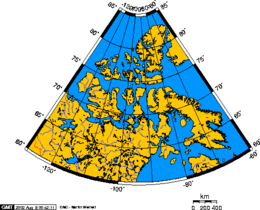 The archipelago extends some 2,400 km (1,500 mi) longitudinally and 1,900 km (1,200 mi) from the mainland to Cape Columbia, the northernmost point on Ellesmere Island. 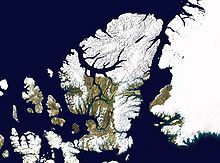 It is bounded on the west by the Beaufort Sea; on the northwest by the Arctic Ocean; on the east by Greenland, Baffin Bay and Davis Strait; and on the south by Hudson Bay and the Canadian mainland. The various islands are separated from each other and the continental mainland by a series of waterways collectively known as the Northwestern Passages. Two large peninsulas, Boothia and Melville, extend northward from the mainland. After Greenland, the archipelago is the world's largest high-Arctic land area. The climate of the islands is arctic, and the terrain consists of tundra except in mountainous areas. 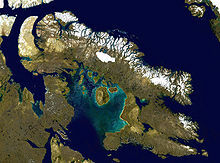 Most of the islands are uninhabited; human settlement is extremely thin and scattered, being mainly coastal Inuit settlements on the southern islands. ^ Marsh, James H., ed. 1988. "Arctic Archipelago" The Canadian Encyclopedia. Toronto: Hurtig Publishers. ^ Wayman, Erin. "Canada's ice shrinking rapidly". Science News. ^ "Canada". World Statesmen. Retrieved 30 June 2016. ^ "Northwest Passage gets political name change". Edmonton Journal. Archived from the original on 2016-01-16 – via Canada.com. Aiken, S.G., M.J. Dallwitz, L.L. Consaul, et al. Flora of the Canadian Arctic Archipelago: Descriptions, Illustrations, Identification, and Information Retrieval[CD]. Ottawa: NRC Research Press; Ottawa: Canadian Museum of Nature, 2007. ISBN 978-0-660-19727-2. Aiken, S. G., Laurie Lynn Consaul, and M. J. Dallwitz. Grasses of the Canadian Arctic Archipelago. Ottawa: Research Division, Canadian Museum of Nature, 1995. Balkwill, H.R. ; Embry, Ashton F. Arctic Geology and Geophysics: Proceedings of the Third International Symposium on Arctic Geology (Hardcover). Canadian Society of Petroleum Geologists. ISBN 0-920230-19-9. Brown, Roger James Evan. Permafrost in the Canadian Arctic Archipelago. National Research Council of Canada, Division of Building Research, 1972. Cota GF, LW Cooper, DA Darby, and IL Larsen. 2006. "Unexpectedly High Radioactivity Burdens in Ice-Rafted Sediments from the Canadian Arctic Archipelago". The Science of the Total Environment. 366, no. 1: 253-61. Dunphy, Michael. Validation of a modelling system for tides in the Canadian Arctic Archipelago. Canadian technical report of hydrography and ocean sciences, 243. Dartmouth, N.S. : Fisheries and Oceans Canada, 2005. Glass, Donald J.; Embry, Ashton F.; McMillan, N. J. Devonian of the World: Proceedings of the Second International Symposium on the Devonian System (Hardcover). Calgary, Canada: Canadian Society of Petroleum Geologists. ISBN 0-920230-47-4. Hamilton, Paul B., Konrad Gajewski, David E. Atkinson, and David R.S. Lean. 2001. "Physical and Chemical Limnology of 204 Lakes from the Canadian Arctic Archipelago". Hydrobiologia. 457, no. 1/3: 133-148. Michel, C Ingram, R G, and L R Harris. 2006. "Variability in Oceanographic and Ecological Processes in the Canadian Arctic Archipelago". Progress in Oceanography. 71, no. 2: 379. Porsild, A.E. The Vascular Plants of the Western Canadian Arctic Archipelago. Ottawa: E. Cloutier, Queen's printer, 1955. Rae, R. W. Climate of the Canadian Arctic Archipelago. Toronto: Canada Dept. of Transport, 1951. Van der Baaren, Augustine, and S. J. Prinsenberg. Geostrophic transport estimates from the Canadian Arctic Archipelago. Dartmouth, N.S. : Ocean Sciences Division, Maritimes Region, Fisheries and Oceans Canada, Bedford Institute of Oceanography, 2002.